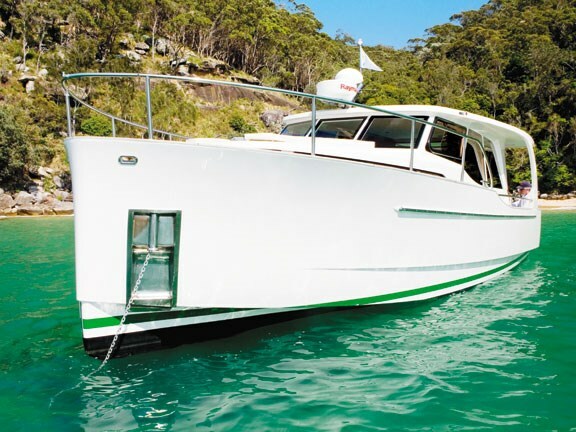 The collaboration between boatbuilder (Seaway), boat designer (J&J) and engine maker (VW) has resulted in a practical single-cabin weekender with walkaround decks, seamless indoor-outdoor living areas, and a layout that will comfortably sleep a family of four. The Greenline is Seaway’s latest line, with the 33 tested to be followed by a two-cabin 40 to be released in March next year. 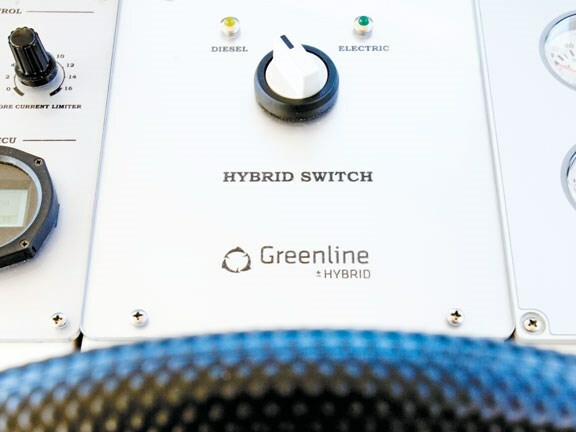 Tilen Jakopin, sales director of Greenline, believes his Greenline is the way forward. "We leave the marina [in electric mode] without smoke and little wake. We think this is the way ahead for the industry and we’re ahead of the car industry," Jakopen tells us. With twin 200L diesel fuel tanks the cruising range is up to 700nm in diesel mode, but more than 1000nm as a hybrid, Jakopen claims. "The lithium battery has a guaranteed life of 1500 charges, which equates to up to 10 years based on one cycle every two to three days." The fit and finish are five star thanks in part to injection moulding. Add European styling, a coffee maker on the counter, warm timber joinery, and you get a cruiser that feels – and sounds – at one with its surrounds. The TDI 165-5 is a compact inline five-cylinder electronic turbo-diesel engine with common rail injection. There is an electric motor in series near its ZF transmission then the shaft in a half tunnel and the go-fast/go-slow all-purpose prop. The diesel block sits in a sound box that dampens noise to the point that clatter is non-existent. The engine comes with electronic diagnostics and monitoring on the dash and, if they alert you to an issue, you can then reach all the components, fillers, and strainers easily. Under the saloon floor, most of the other gear, including the batteries, is housed outside of the engine box in an engineering space. This is accessible under the companionway steps that lead down to the cabin. Conventional mode: Switch on ignition, turn the key to start the 165hp VW diesel engine, advance the throttle, and go boating up to 15kts top speed (10kts with base 75hp VW) with a 9 to 12kt pleasant cruise. 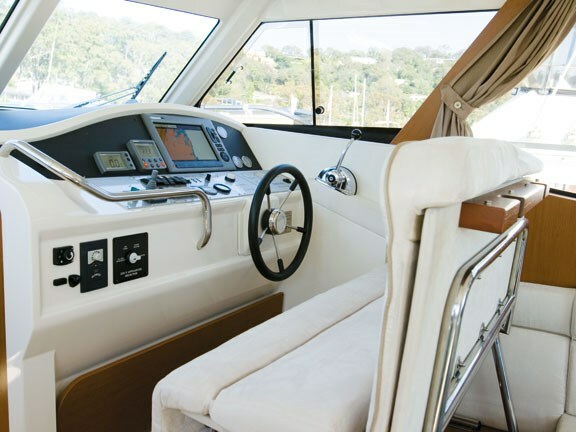 Hybrid mode: Switch on ignition (or switch off diesel engine if it’s running), flick switch on dash from diesel to electric, and go boating up to 6kts using the 7kW electric motor. At 4 to 5kts, you can run for four hours or 20nm before recharging. 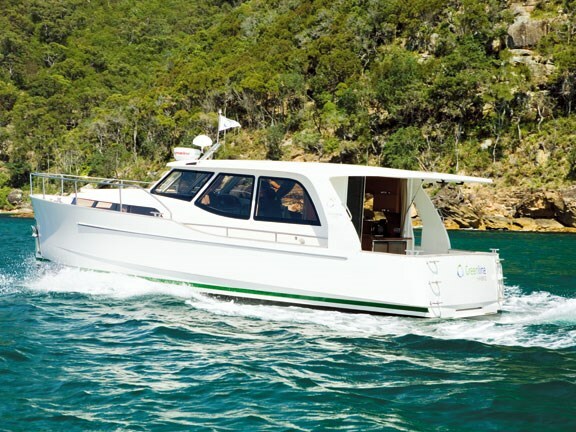 The Greenline 33 has three battery banks: a separate 100amp 12V AGM engine-start battery, one 200amp 12V house AGM battery, and a 240amp 48V lithium battery that powers the electric motor and, through the inverter, creates 240V for your onboard outlets, and 12V onboard power from 240V Shorepower and the electric engine/generator. Recharging is via six photovoltaic solar panels on the cabin hardtop that work off light rather than sunshine. They generate 1.3kW, or up to 80 percent charge, after a full day going nowhere. With the diesel engine running, the adjoining electric motor acts as a 5kW generator that will do the same charging job but in four to five hours. Or plug into the shore-power and recharge to within 70 percent capacity via the Victron charger/inverter in the same time-frame. As a bonus and thanks to the solar panels, you don’t have to leave your boat on shore-power to keep the fridge cold. At rest, the boat functions as a lifestyle platform. A remote control extends the transom to increase cockpit space (by 4m²). 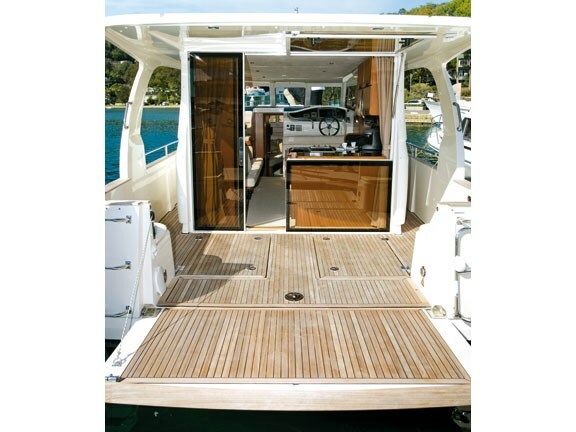 Under-floor is abundant dry storage for watersports and fishing gear, while the teak decks continue forward, up sidesteps, to a foredeck with sunpad. An awning window and opening glass door connect the saloon to the cockpit. 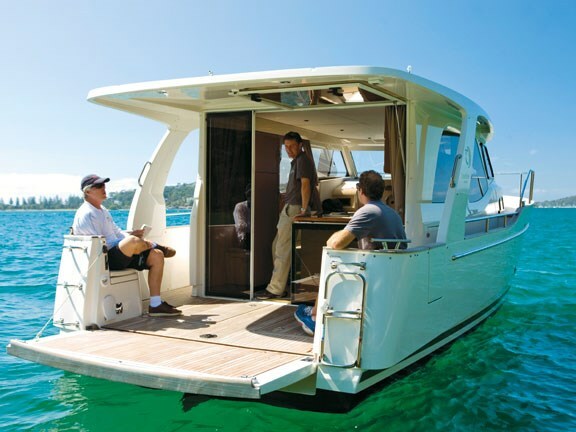 Although the hip-space through the companionway could be wider, the headroom is generous through to the bow. The aft galley includes an upright fridge-freezer, 300L of water, and fiddle rails and handrails. The dinette will cater for four, there’s a settee that doubles as a daybed or crew bunk, and a flat-screen television will keep you entertained at night. Besides air-con, there are opening side windows and a big cabin hatch. We hear you can get a sliding roof option at the expense of some solar panel charging. Storage exists in lockers, a wetbar and under-seat areas. For a couple, the cabin is big. 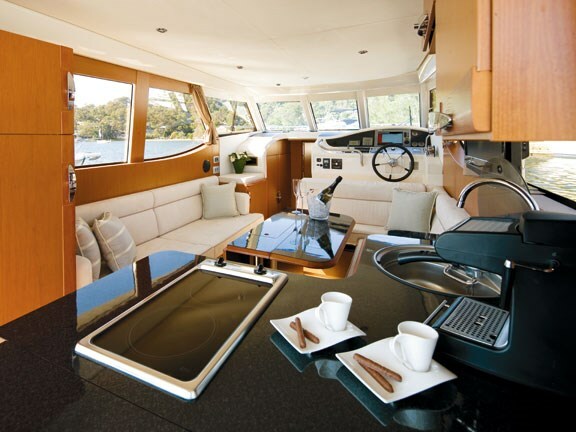 Although three can sleep aboard comfortably, Seaway says by converting the dinette you can accommodate up to five. 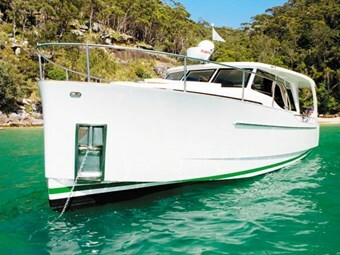 The Greenline 33 has a blunt stem and stern to maximise waterline length and, thus, speed. There are hard chines up front but a round bilge back aft. She leans outboard like a yacht in the turns. But only so far. Twin fixed rudders or fins – upon which it is possible to rest the boat when the tide retreats – provide lateral and directional stability. A keel with shoe protects the running gear should you beach or bottom out. When in go-fast diesel-engine mode, the prop tunnel assist with propulsion via the fact the shaft angle is kept low. Draft is just 0.75m. In terms of efficiency, at 5kts, we were electric boating for nix. At 3000rpm and 10.3kts, the 165hp diesel is using just 16L/h. This climbs to 23L/h in get-home 12.8kts fast cruise mode at 3400rpm. Top speed is said to be 15 knots. Handling at low speed was a tad heavy and apparently a lighter oil was to be fitted to the steering. At high speed, up to 15kts, she felt willing and able. But it’s in electric mode that the motion is intoxicating if not hypnotic and sedating. 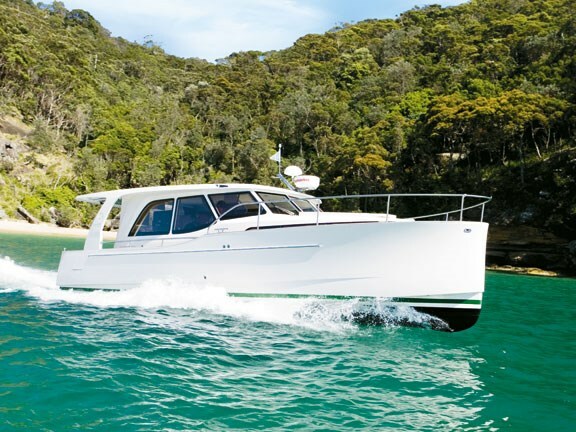 To be released in New Zealand by Voyager Catamarans NZ Limited. For more information email richard@voyagercats.co.nz, ph 0274 926 216 or 09 478 2220.